“This track is suitable for fit and experienced trampers only”. 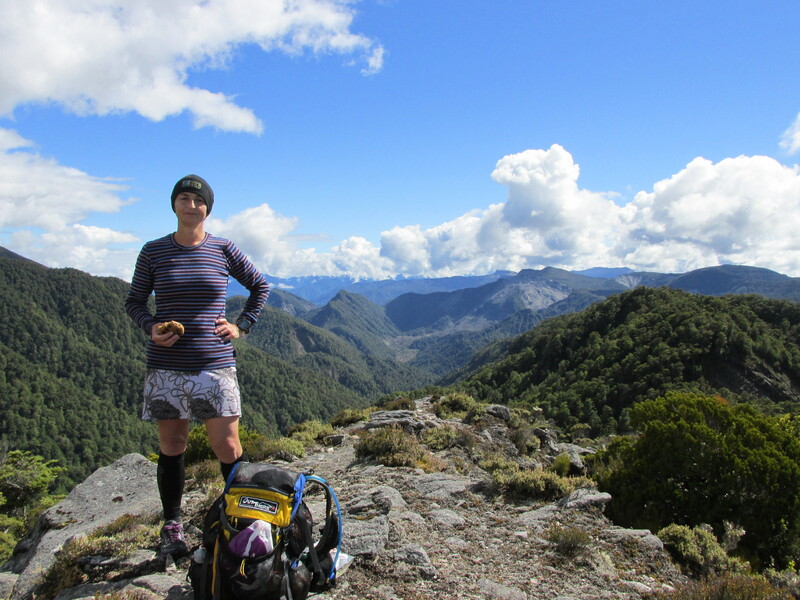 Vicki Quinn and I exchanged smug glances over steaming cups of tea in the Mokihinui Forks Hut. Track builders Pete and Bill were taking a lunch-break from working on the uncompleted 30km middle section of Old Ghost Road. Bill continued, “It’s pretty rough. Rooty. And muddy”. “We like that!”, we said. “You’ll be pulling yourself up, falling down things”. “Even better” we smiled. It was Pete and Bills turn to exchange smug glances. Smug on smug – who would win? VQ and I were fast packing the 80km OGR. Fresh off a two-day Heaphy and with 130km in our legs, we were fit, confident and blissfully unaware that the smiles were about to be slapped right off our dials with the force of a wet branch. 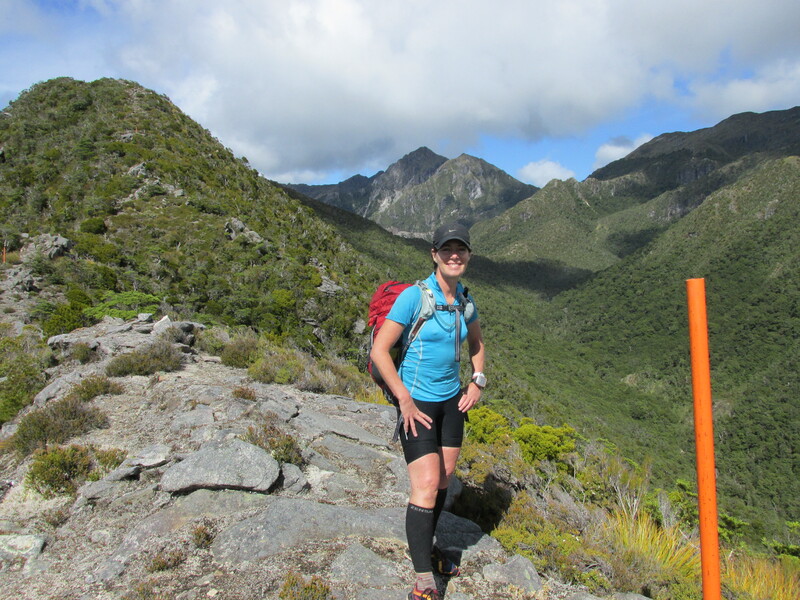 The first 25km was pure magic as we glided through stunning rimu and beech glades. 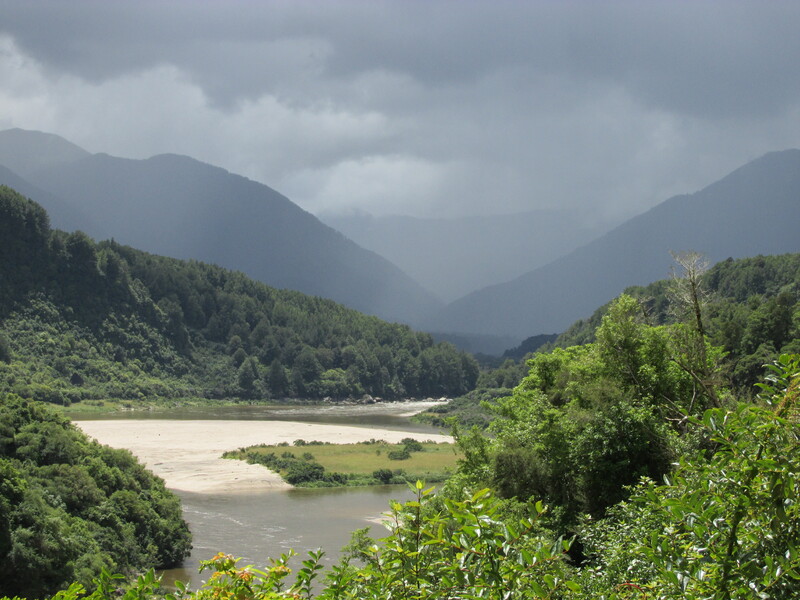 The track danced along hugging granite and slate cliffs above the roaring Mokihinui River. After a couple of weeks of heavy rain, recent slips and swollen stream crossings kept us on our toes: twice we were baffled by hidden waterfalls thundering through the rocks beneath our feet. Wild goats undeterred by our presence leapt off the path at the last minute and we saw a single prized powhelliphanta shell. Shortly after leaving Mokihinui Forks Hut the sand and gravel petered out and it became rooty and muddy. We skipped along composing cheeky notes to Pete and Bill in our minds. Then just beyond Goat Creek Hut the track just.. well.. stopped, at the bottom of a steep, densely forested climb. A single orange triangle glared unblinking at us. We wandered back and forth for a while before accepting (in the absence of another alternative) that we had struck the ‘unformed’ section. Six hours and 13km later we reached our destination for the night – Stern Valley Hut – shocked, exhausted, and just as our bunkmates were climbing into bed. Here is the ‘uncut’ version (see what I did there?) of the preceding six hours. We crawled through tangled undergrowth of fern and supplejack. Pulled ourselves up impossibly steep climbs, sliding back down as branches broke under our weight. Snagged our packs under enormous toppled trees. Fell through rotten debris time and time and time again. 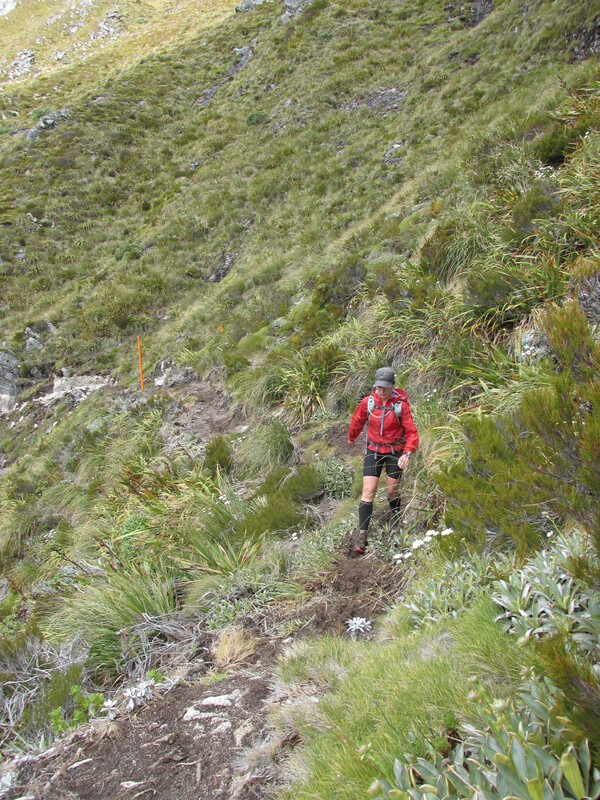 Tore our exposed knees and thighs on clumps of bushlawyer, cutty grass and stiff stubby manuka shrubs as we crossed river flats and mountain tops. Scraped shins, knees and elbows on small granite rocks in stream crossings and enormous boulders dumped by ancient slips. With no track to follow, no footsteps to follow, navigation was by putting our head as close to an orange triangle as possible and eyeballing the forest for the next triangle. We got a little lost many times. We got a lot lost for nearly an hour and as the last light drained out of the day, it became increasingly difficult to spot the markers. Thoughts as black as the beech surrounding us filled our heads: what if one of us fell off a cliff or got injured? What if we lost the track and couldn’t find it again? Was our preparation sufficient to survive a night in the bush? Our pace quickened and we fell more as a sense of urgency descended with the setting sun, until without warning, we burst into the clearing that housed Stern Valley Hut. After a short sleepless night and an early start we launched ourselves back into the leering undergrowth with grim determination for another 12-hour day. I wanted to be running a road marathon. I wanted to be running the Goat section of Round-the-Mountain in the dark and sleet. I wanted to be anywhere except on that effing track with its myriad of spiky things tearing at my flesh with every pathetic forward step I managed. After climbing past the highest point on the track along Skyline Ridge, we reached Ghost Lake Hut in 5½ hours. Never have I been so happy to see a formed track – I almost knelt to kiss the gravel and gently caress the smooth riverstone edging with cut and bleeding hands. The horror should have ended there. And it could have… if I wasn’t an “Option D: all of the above” kind of girl. By text we had managed to move our pickup to 5.30pm, and as we were now running downhill on groomed trail, we would have made that easily. Except I spotted what appeared to be a shortcut on the map that passed through two historic mining towns.. once more, VQ and I found ourselves on orange-triangle delineated single-track. Clearly all the DoC resources are going into OGR because the trail was seriously overgrown: after running out of markers and suddenly faced with a “No Entry: Construction Zone” sign, we turned and ran as fast as our legs could carry us back to the main trail and out to the car park. Only the sobering thought of spending a cold, hungry night in a car park could have spurred our legs into a flat-out 6km sprint after more than 200km on our feet in six days! The Trail Gods finally smiled on us, because the lovely Jess from Hike’n’Bike Shuttles was waiting rather anxiously in the car park: if we hadn’t been so smelly we would have hugged the poor lass. 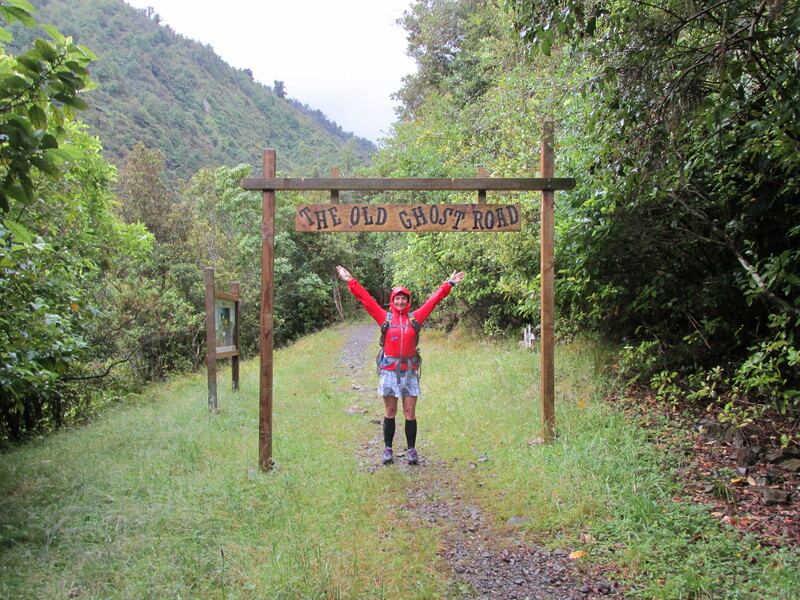 This entry was posted in Great runs and tagged adventure running, Old Ghost Road, trail running, west coast. Bookmark the permalink. Ah, “short cuts”, have to love them ! Awesome write up VW, sounds like a most excellent adventure. Would it be easier going the opposite way than you did ? Sounds like an ‘epic’ tramp. Great read too. I know exactly what you are talking about. My husband and I did it in February 2014. That middle unformed section was very tough. I was covered in dried blood and mud by the time we got to Forks hut. But overall, I enjoyed the Old Ghost Road, and look forward to returning when it is complete. We 3 trampers 64,66 and 72 loved it..first week in April. Only 1 day of light rain but would not like to do the unformed section in rain/wind. It was tough, took us 8 hours each of the 2 days in that section. Not unlike slogging in the tararua’s !!!!! pleased you liked the track. that bush section of track above goat crk is nearly finished, and we are now based at stern hut and have done half the bush section there.